This step runs through towns, forests, mountains and an almost half desert. The only complication is the ascent to Monjardín. From this point and until the end of the stage the route is on good ground, but the hot days the absence of shade makes it difficult to take a break. It is worth stopping in Villamayor, since in the last 12 kilometres is impossible to buy a drink. In Ayegui visitors can enjoy a good glass of wine thanks to the Bodega of Irache. In Azqueta, pilgrims are required to stop and chat with Pablito, now an institution on the pilgrimage route. The way out of Estella can be somewhat uncomfortable. You have to return to the other side of the river Ega and head south on the streets of San Nicolás and Camino de Logroño. It's a long farewell, and glued to a road with heavy traffic from early in the day, it later joins the NA-1110. A good reference point is the roundabout with a bronze sculpture preceded by a petrol station. At this point hikers should turn right into a garden area. The road enters the town of Ayegui, which according to the map, was absorbed by the spectacular growth its bigger neighbour. After leaving a fountain there is a sign for the hostel of Ayegui, situated at the bottom of a sports centre. After going down a short slope the route returns to the NA-1110. At the other side of it is the famous Bodegas of Irache. Under a carving of Santiago there are two taps. From one of the taps flows water and from the other wine. Above it there is a webcam installed. Do not miss the chance to greet your loved ones. A few meters ahead you reach the monastery of Irache, the result of a medley of medieval, renaissance and baroque architecture. This shows that it has been thriving over the years, partly because of its proximity to the Camino of Santiago, a circumstance from which it has benefited. Since 1887 it has been declared a national monument. You can visit the church and cloister. It is likely to end up becoming a Parador of Tourism (A luxury hotel). The exit from Irache, on the path, of dirt and gravel, continues until you reach a crossroads where there are signs for two different routes to Los Arcos. The original one runs through Azqueta, where you will meet one of the most famous characters on the Camino. The other, by Luquin, is well signposted and is somewhat shorter. Those who choose to visit Azqueta (the vast majority) will return to the road, for which you must travel back a few feet to enter a secondary route that is well signposted for pilgrims. On the left there is the three star Hotel Irache. In front, Camping Iratxe, a great place. The campsite, with accommodation (in buntalós or tents), has a restaurant, bar and supermarket. Once the site is left behind, the asphalt path ends and is replaced by a dirt track. From here travellers go through a small tunnel before entering the leg breaking trail surrounded by oaks, and only interrupted by a secondary road and little traffic. A damaged sign informs that this land had once been home to the Igúzquiza hospital, it has now disappeared. Across the road, more ups and downs until arriving to Azqueta, a small town that welcomes pilgrims with a funny graffiti on one of its walls. This village has a bar and a rural tourism house, but without doubt, the most famous thing in Azqueta is Pablito, one of the most beloved and admired characters on the Camino de Santiago. In a way he is considered the precursor of contemporary pilgrimages. Pablito Pablito (he dislikes Pablo) is usually waiting for pilgrims on a bench at the entrance to the town. Pablito, a strange character, gives away hazel walking sticks, pumpkins, and scallop shells to the pilgrims marching on route to Santiago. He also reveals all his secrets about his trademark techniques to coordinate the stick with his feet. One rest for every four steps. No more, no less. Back in the 60s Pablito was one of the first people to do the pilgrimage of Santiago by bike. 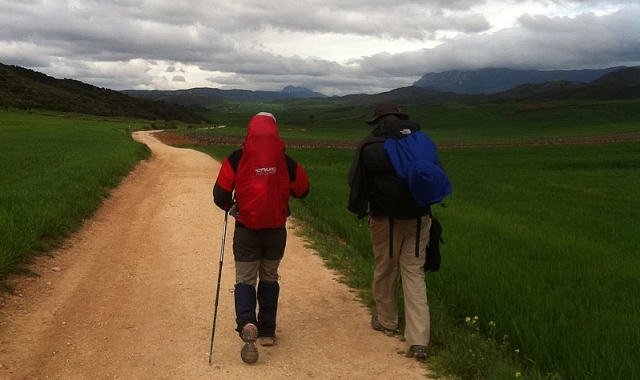 Since then, he has completed the Camino on countless occasions. He himself cannot remember how many. The exit from Azqueta, on a path that descends to the right, passes some agricultural buildings to then turn left, to where hikers start the one kilometre ascent to Villamayor de Monjardín. On a narrow and poorly preserved path, surrounded by vineyards. Before reaching the peak on the right hand side, there is a fountain, Fuente de Moros, a few meters before arriving in Villamayor de Monjardín. The XIII fountain (sourced from an underground water reservoir) was built to quench the pilgrims’ thirst. It has been very well preserved. It should be noted that from Villamayor de Monjardín to Los Arcos (12 km) it is not possible to buy supplies. Pilgrims can only satisfy their thirst at a fountain close to the junction with the road to Urbiola, near the beginning of the journey. Descent to Los Arcos As it can be no other way, the exit from Villamayor de Monjardín is a descent down a steep track, adjacent to the vineyards. Once at the foot, the path begins a long straight stretch through the endless fields of Navarra. The only break from monotony is a couple of crossroads, and the agricultural machinery noise from work on nearby farmland and signposts. For some pilgrims it becomes a tedious journey, as the scenery does not change much until the arrival of a pine forest, and very near the end of stage. Others enjoy this walk, well signposted, with favourable terrain on a wide dirt track. "It gives me time to think.,” they say. In Los Arcos, an old garage has been converted into seating area and welcomes pilgrims before accessing the town centre. Caution should be taken on the way out of Estella as there is heavy traffic. The ascent to Villamayor de Monjardín is complicated. Not excessively long, but some sections are on bad ground. From Villamayor de Monjardían to Los Arcos, the terrain is favourable. At the beginning of the section it crosses a couple of local roads. 1 reviews Distance to Santiago: 660 km. 1 reviews Distance to Santiago: 653 km. 1 reviews Distance to Santiago: 643 km.